The word “undercutting” is used by A&A Company and the thermal spray industry to refer to the amount that a component is turned or ground undersize to provide the space for the sprayed coating. The undercut depth will depend on the specified coating material and thickness requirement. For most repairs, it is necessary that the compenent be undercut below any damage (wear, erosion, corrosion etc). As such, the finish thickness of coating will be equal to the depth of the undercut and vice versa. 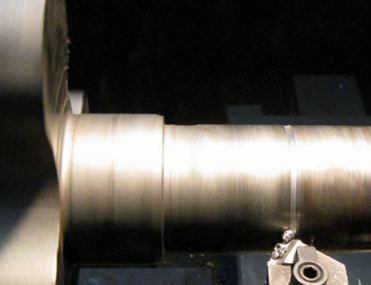 A&A Company offers a full, turn-key thermal spray coating service which includes undercutting. Take the guess work out of prepping your components for coating, leave it to the experts. When undercutting for a sprayed coating, deep, square shoulders should be avoided where possible. Shoulders of undercut sections should usually be cut square with a radius of 0.015″ to 0.020″ left at the corner. Want to learn more about A&A Coatings?